The recent opening of the 2.4-mile San Elijo Road/Twin Oaks Valley Road extension hasn't affected San Elijo Hills' small-town ambiance, but it has been a huge boon to residents, by creating a shortcut to downtown San Marcos, Cal State University San Marcos and the 19 restaurants in Old California Restaurant Row. SB&O has been side-by-side with local homebuilders for 40 years, through the good times and the not so good times. For the past 20 years, SB&O has supported a clientele that is predominantly developers and homebuilders. Due to long-standing relationships, and the intrinsic value that working with people for long periods of time brings, SB&O is able to continue to assist clients during economic change. The developer behind the new $30 million Hilton Garden Inn and Riverfront Conference Center in Yuma has secured financing for the first major components of the much-anticipated and historically significant Pivot Point redevelopment project. The new home master-planned community of Del Sur, located north of SR-56 in the city of San Diego, continues to be recognized as a community that conserves natural resources while providing sustainable, smart-growth design and living practices. Davidson Communities this year earned the home building industry's equivalent of the Oscar for the 12th time in the company's 29-year history, taking home the coveted Grand SAM Award for excellence in architecture, interior design and merchandising for Scripps Preserve at The Estates at StoneBridge in Scripps Ranch. Davidson's first Grand SAM was in 1980 for Leucadia Village in Encinitas. Who controls and benefits from fire insurance policy proceeds? As the Witch Fire blazed through North County in October, some of San Diego's most elite ZIP codes were hit hard. Multimillion-dollar homes and estates were either leveled or severely damaged by smoke and falling ash. As these wealthy homeowners begin the rebuilding process, they are finalizing insurance settlements that could pay them millions of dollars to rebuild what once were grand estates. At the same time, they are learning some hard truths about the terms of their mortgage loans. Is it a good time to buy in San Diego? Judging from the local news reports about the state of the housing market, it's no wonder that consumers are asking if the right time to buy a home in greater San Diego has passed. We had grown accustomed to double-digit growth in home values over the past few years, and many consumers viewed their homes as either a short-term investment or an ATM for withdrawing cash for cars, vacations or credit card debt. NEW YORK -- Homeowners started losing hold of their homes years before spiking foreclosures and the housing slump slammed the economy. MEEKS BAY, Calif. (AP) -- One of the last old-time estates on the west shore of Lake Tahoe is up for sale. The old adage "if I only knew then what I know now" definitely holds true for many commercial real estate investors and property owners. Too many owners/investors have bought properties thinking they understand all the problems associated with the property only to have a myriad other issues crop up later. It may sound hard to believe, but one part of the mortgage market is hot: reverse mortgages. And that's giving older homeowners more options to tap the equity in their homes -- but also opening the door to more confusion and mistakes. New-home financing from the Veterans Administration is now offered by Shea Homes. Joshua Volen is one of the top office and industrial investment specialists in the San Diego office of Marcus & Millichap. On Oct. 22, San Diego County residents were once again faced with one of the major dangers of living in beautiful Southern California: wildfires. "San Diego has the location and the physical foundation in general for an important, perhaps a great city. Its people are awake to its needs, and are resolved to meet them. It stands, therefore, upon the threshold of a truly sound and far-reaching development; for, when to superb natural advantages and human enterprise are added a sound public policy and a comprehensive plan of action, who can doubt the outcome?" The University of San Diego's Burnham-Moores Center for Real Estate, along with the Florida-based Hoyt Institute for Real Estate (HIRE), is launching a nationwide search for commercial real estate professionals interested in becoming volunteer mentors or mentees. Foreclosure: the very mention of it causes emotion. People losing their homes; lending institutions under distress; economic indicators moving downward; communities and the people who live in them losing property value. Reality check for housing: Is it an investment or consumption? By now you have heard about people losing a lot of money on housing purchases, especially those made during the recent peak years of 2004 and 2005. The countywide apartment vacancy rate has declined from 5.1 percent in the spring to 3.4 percent in the fall, but the wildfires don't appear to have had much of an affect on occupancy. LOS ANGELES -- The percentage of households that could afford to buy an entry-level home in California stood at 24 percent in the third quarter of 2007, unchanged from the same period a year ago, according to a report released by the California Association of Realtors (C.A.R.). Ask Randy LaChance what it takes to be one of Voit Commercial Brokerage's top salesmen in San Diego and he'll say integrity, honesty, hard work and the ability to cultivate long-term relationships. When it comes to investing in multifamily real estate, few counties in the United States compare to San Diego. British-born Michael "Mick" Pattinson, president of Carlsbad-based Barratt American, is a Southern California homebuilding industry titan whose passion for housing is rooted in humble beginnings. 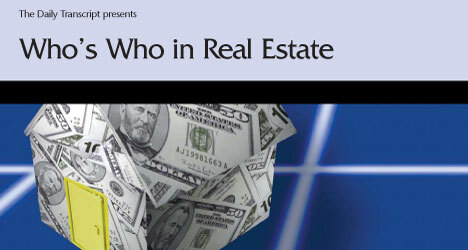 If you think these must be tough times for real estate agents, Andrew Nelson has news for you.